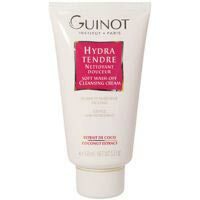 Guinot Hydra Tendre contains: Water (Aqua), Potassium Stearate, Glycerin, Triethanolamine, Palmitic Acid, Stearic Acid, Sodium Lauroyl Sarcosinate, Sorbitol Cocamidopropyl Betaine, PEG-32, Myristic Acid, PEG-6 Stearate, Sodium Laureth Sulfate, PEG-32 Stearate, Propylene Glycol, Butyrospermum Parkii (Shea Butter) Extract, Fragrance (Parfum), Trisodium EDTA Items marked with red have tested a 3 or above (out of 5) in comedogenic (pore-clogging) testing. helped to reduce my breakouts doesn't dry skin seems to clean really well a little goes a long way price!! doesn't specifically help with breakouts (i.e. doesnt contain acne fighting ingredients) a bit harder to rinse off than other cleansers i got talked into buying this by the lady that gave me a facial and i really love it because it's gentle and non-irritating and my skin feels cleaner than with other cleansers. also, when i've run out of it and switched to something else my breakouts seem to get worse. but it is ridiculously expensive for a cleanser. i agree you should try to get a sample before committing.